When you write about video games for a living, you're occasionally faced with the launch of a game so big that even random people you haven't heard from since high school will reach out to ask for your opinion. For a long time, that game was Grand Theft Auto V. Then for a hot second, it was Flappy Bird. Now—at least as far as the random messages I've been receiving from high school classmates go—it's Watch Dogs, the new cybersecurity-themed open world game from Ubisoft. Since the game was announced two years ago, it's been described by critics and expectant fans as being like Grand Theft Auto, only with smartphones instead of guns. I'm talking about the game here as if it's still in its pre-release phase because, for me, it sort of is. That's what I've told the many people that have reached out to me since the game came out last week. I haven't started playing Watch Dogs yet. I'm probably not going to for a while, either. This isn't because of any technical or logistical problem. The blue-edged plastic case for the PlayStation 4 version of Watch Dogs has been sitting on the edge of my TV-side table since the day the game came out. I even took the plastic off one night after getting home from work and hovered over the game for a moment, debating powering up my console and seeing what the its near-future version of Chicago really looks like in practice. I couldn't bring myself to sliding the disc into my PS4, however. Honestly, I'm scared to. Partly this is just a matter of scheduling. The game industry's largest annual convention takes place next week, so life is pretty busy for everyone at Kotaku, myself included. I had to review Murdered: Soul Suspect this week, which ate up 15-plus hours I could have spent playing other, better games instead. And last week I had to move to a new apartment and then travel out of state two days later, which separated me from my consoles temporarily. There are also a lot of really good games coming out that demand my attention. I mean, a lot. Mario Kart 8 finally arrived last week, and I'm thrilled to finally start playing the game with more of my far-flung gaming friends. I didn't expect it to, but Wolfenstein: The New Order has seized me in a profound way. Child of Light, another recent Ubisoft game that received high marks, is glaring at me from the top of my mountainous pile of shame. And I still want to replay Transistor another four or five times when I have the chance. All these other games offer far more tightly framed, succinct experiences than Watch Dogs. That can be good or bad depending on how you look at it, but open world games have always been an incredible time sink for me. Shortly after picking up Skyrim back in 2011, I remember opening up my Steam account and seeing that I'd already spent 50 hours in that game. 50 hours! That's more than two days of my life I knew I was never going to get back. All that time, and I'd barely completed the first step in the game's main story-driven quest. That part only took me an hour or two. I honestly have no idea what I was doing for the other 48 other than wandering around and admiring the game's gorgeous scenery. Open world games are overwhelming for me, in other words. That's part of what makes them exciting. But as all the visual and mechanical parts of games become increasingly impressive and life-like, the first step into a virtual world brimming with life becomes more intimidating in turn. When I first got Grand Theft Auto V last year, I spent the majority of my first night with the game just driving through the city of Los Santos, gawking at how intricate everything in its world felt. Delving into an open world game isn't a simple matter of making a purchase and completing a story in 12 hours or so. It's a contract I form with a game, a pledge I make to dedicate the next few months of my life to living with one foot inside a virtual world. The next few months at the very least—I'm still playing Grand Theft Auto V, and I haven't even finished the main storyline yet. These all feel like excuses I'm making for myself, however. The real reason I'm scared to play Watch Dogs is that I'm not sure if I'm going to like it or not. And I really, really want to like Watch Dogs. For a long time, the hype for this game was incredible. The "Grand Theft Auto with smartphones" descriptor wasn't just rhetorical flair; Watch Dogs looked like it could be the rarest kind of big-budget video game: one that's culturally and politically relevant in a truly immediate way. It's hacking and surveillance states themes are practically ripped from newspaper headlines, after all. If Ubisoft could keep its ear to the streets while also managing to make a game even half as fun as Grand Theft Auto? Well, it sounded too good to be true. For me, it's still too good for me to actually go and see if it is true. Something happened that seemed to sour people's opinions about Watch Dogs. It finally came out. And now that the game is available for all to play and see, the reaction has been mixed at best. A year ago, Kotaku editor Stephen Totilo described it as a game that "needs to be on your radar." Yesterday, Kirk Hamilton gave his verdict in our official review, and said: No, this game isn't worth playing. 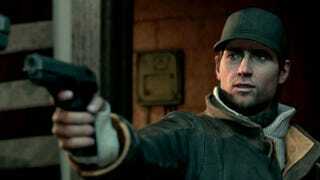 My first question for Watch Dogs was, "Well, what if I don&apos;t want to shoot Maurice?" I'm still going to play Watch Dogs despite Kirk's warning. But for the moment, I want to keep the fantasy of what I want this game to be in suspended animation.